World 1-3 is the third course of World 1 in Super Mario 3D Land. It takes place in a valley high in the sky. The icon is a stone cliff with large wooden "steps" descending from it. Mario starts on a rock. In this rock, a pair of Binoculars can be used to see Toad above the right cliff (granting Mario a Star Medal). 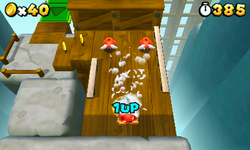 Ahead, in some wooden platforms there are two Piranha Plants and a Roulette Block. More platforms are found, each time lower, with Biddybuds, a Koopa Troopa and a Note Block. At one point, Mario finds a Mystery Box. Inside it, there is a purple room with three ? Blocks, two with a single coin and one with multiple coins. After Mario leave the Mystery Box, he faces with more Biddybuds and Para-Biddybuds. In the next area, Mario must ride a direction-change platform to cross a small cliff. In the other side, is positioned a Checkpoint Flag, Fire Piranha Plant and many trunks. Mario must go to the right, where a Rainbow ♪ Block is found. Some clouds help Mario to traverse another cliff. Above them is a Red Ring. After, Mario jumps over a rock pillar. Jumping to a far below platform where Mario must ride another change-direction platform under some ? Blocks. The plumber must jump over Hard Blocks until he reaches near the place where some Biddybuds and the Goal Pole are located. Star Medal 1: The Medal lands on a Note Block after Mario uses the Binoculars to catch sight of Toad. Star Medal 2: The second Star Medal is located in a Coin Heaven that can be accessed after Mario jumps on the Rainbow ♪ Block. Star Medal 3: Above one of the clouds to the right of the second Fire Piranha Plant. If Mario or Luigi looks into the binoculars at the beginning of the level and then wait long enough, a flying saucer will appear in the sky only to move around for a bit and then fly away.